He's so good to me. And He most certainly is. He's so good--far beyond what I deserve. These last few weeks, I've been struggling so with anxiety and depression, as I've transitioned medication because of the pregnancy (from Paxil, an SSRI, to Wellbutrin, for those in the know) and, at the same time, anticipated (dreaded?) Violet's eye surgery. I've had countless "What ifs?" go through my mind and it's been exhausting. Today, I praise God for sustaining me throughout the last few weeks, and for bringing Violet through the surgery. It was the best possible outcome--they had to do the minimum (only probing of the left eye--no intubation or balloonplasty or moving of bones and nothing to the right eye) and there have been no complications. So, am I the only weirdo that brings a camera when their child has a medical procedure done? Maybe I was just trying to convince myself of how great it would be. Regardless, I took a few shots that I've posted below. We left my parents' house at 5am (We slept there so neither Amelie nor her dear grandparents had to get get up so early.) and drove to Johns Hopkins. We arrived at the 3rd floor of the Wilmer Eye Institute at 6am. Here is Violet, in her peach hospital gown, watching Rugrats (or something equally age-inappropriate, yet distracting) while waiting to be called for surgery. I took this photo at 6:24 am. 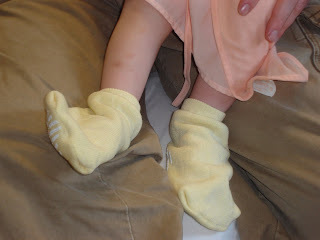 These are the ridiculously huge booties they gave us to put on her. We were called to surgery at 7:00am. We waited, along with other patients and their families, for about 30 minutes. 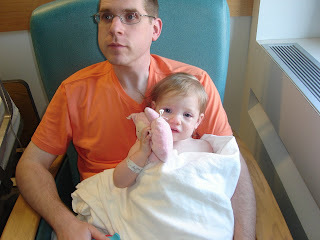 When it was our turn, Duncan went back with the doctors and got to hold Violet until she was asleep. He came out to the waiting room at about 7:45am. Before 8:30am, the doctor came out to tell us how successful the procedure had been. At about 9:15, I got to go into the recovery room and be with her when she woke up. Here, we're back in the pre-op room at 10:40 am, yet now I guess we could call it the post-op room since it was after the surgery. 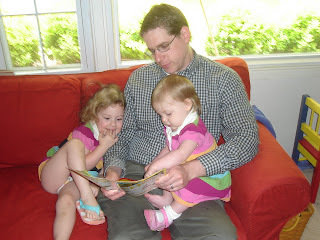 Here we watched Nick Jr's Fairy Tale Extravaganza while Violet ingested about a half gallon of apple juice. We had to wait about two and a half hours following the surgery, just to make sure she was o.k. to go home. Upon release, Violet got to eat strawberries, cheerios, and a cookie in the hospital cafeteria. 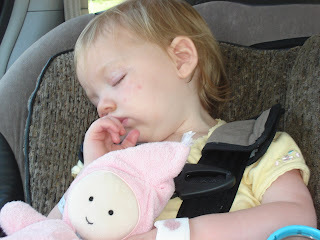 We weren't even out of downtown Baltimore by the time our little patient was asleep. 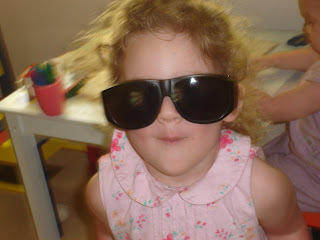 Amelie liked the sunglasses Violet got in her (obviously) generic discharge kit from the Wilmer Eye Institute. She seems to be doing her best glaucoma patient impression in this photo. So thank you for your prayers (and for your encouraging comment, chris f!) Please praise God with me for His goodness and mercy. Just a quick post to let you know that our Violet Ella is having her tear duct surgery tomorrow morning at 7:30 am. This is a quick, out-patient procedure that requires general anesthesia. Please pray that it would be successful and that the Lord would relieve my anxiety. Thank you!! Duncan opening his birthday presents with the girls. We gave him a wheelbarrow (red--Amelie's choice) and an umbrella and stand for our outside table. Violet gets her quilt from Ducky! 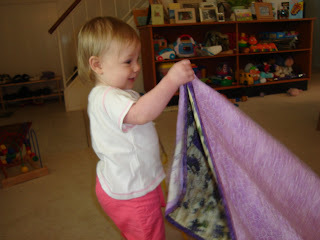 Violet LOVES her quilt from Ducky!! 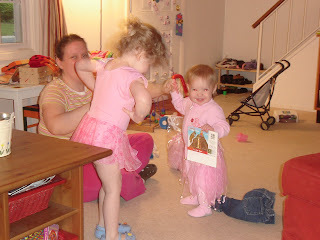 Two ballerinas--I love the look on Violet's face in this one. Amelie now "rests" in the afternoon, instead of napping. Could she still nap? Absolutely. Do we want her to be up until 10:00 every night? Absolutely not. So today, while Amelie was "resting," I was gardening. (Or beginning the "how-long-can-plants-go-without-water-before-they-die" experiment.) She appeared at the screen door with a present for me. It was a picture on a sheet of her ducky notepad. My heart melted and I told her to get some shoes on and to come outside. As she approached me, arm outstretched, I noticed that her face wasn't quite right. The color orange was smeared on either side of her mouth. "What is that all over your face?" "Orange paint from my art supplies." (thanks again for the Christmas gift, Aunt Karen=))"Were you eating it?" "No, I was just licking it." Needless to say, after a call to daddy and to poison control, I learned that orange pee and poop is all we have to look forward to. Amelie was scared out of her mind (sob, sob, "am I gonna die?" sob, sob) which hopefully taught her a lesson. This evening, Amelie was sitting on my lap while I was reading a story to the girls before bed. Amelie stopped me, mid-sentence and said, "Mommy, your legs are spicy this day." Darn shorts weather. Just when Duncan seems to have gotten used to (or is just resigned to) my having not-so-smooth legs for much of life, someone else is going to start complaining. She'll understand. One day. This happened not even a mile, as the crow flies, from our home. Super scary. 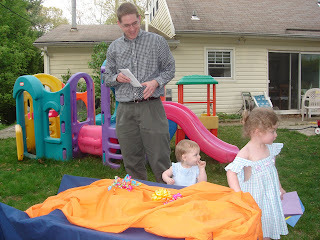 *We've been playing outside a ton and eating outside as well on our "new" patio. The addition of an umbrella for our table (a b-day present for Duncan) has been lots of fun. 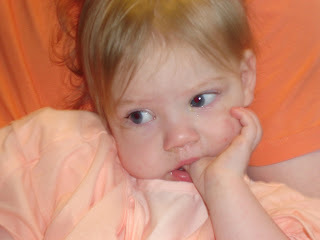 *Violet's tear duct surgery is scheduled for Monday, May 21st in the wee hours of the morning. It's out-patient but requires general anesthesia. This mommy is SCARED TO DEATH of that part of it. If you're a praying person, please pray. *Duncan recently received 2 job offers (one for a company here and one for a company in Pittsburgh, for which he'd be telecommuting). He took the one here after MUCH consideration! He's VERY excited and will start the Tuesday after Memorial Day. Praise God! *Ducky and Grandpa Bob came for a visit last weekend after their two previous attempts had been foiled. They were snowed in both at Amelie's birthday and at Easter! Their visit was short, but very sweet. *I won The Dress in Amelie's size a couple of days ago. We're excited to get it in the mail soon! *Our new van is awesome and our Saturn is just about sold. It's just a matter of paper work and such. We're selling it to a graduating high school senior in our church. I'm so glad we'll be able to keep tabs on the first card Duncan and I bought together! *I'm at the mid-point in my pregnancy already. I can hardly believe it! 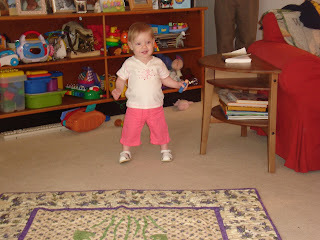 *Amelie is developing her imagination and personality more and more. She makes us laugh so much! *Violet's language continues to explode. Just this morning, upon seeing Amelie's stuffed cat on the kitchen table, she exclaimed, "kitty!" That was a new one!! *I continue to struggle with housekeeping, routine, self discipline, productivity, etc. 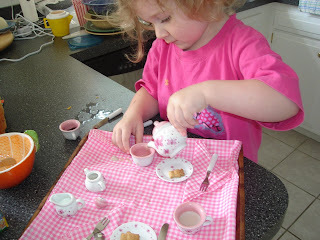 It's just more fun to have a tea party or to blow bubbles! Life is good. Thanks for checking in with me.